A cooperative education program at Rockhurst University in Kansas City, Missouri gave John Stephens a foundation for all of the opportunities in his career, including his current role as senior executive vice president and chief financial officer at AT&T. The program, which allows students to earn academic credit for paid work experience, gave him a path to attend college – a way to pay for an education his family could not have otherwise afforded. “It provided insights into an experience with a professional workplace; insights and experience that I couldn’t have acquired without the program,” the Preston Hollow resident said. 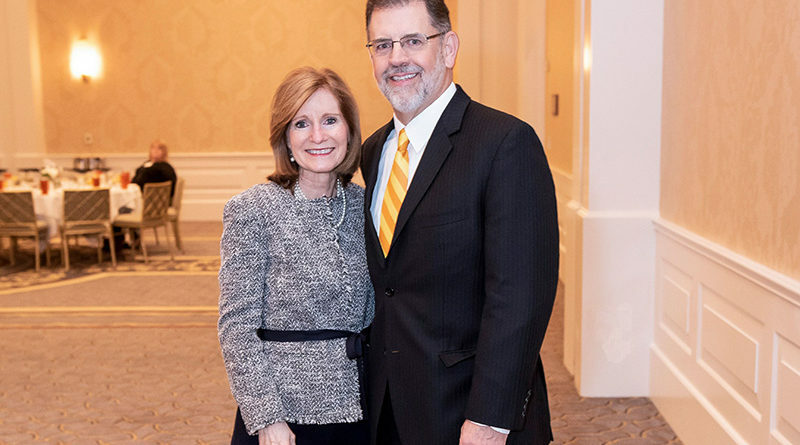 Stephens and his wife, Michele Stephens, were recently honored with the second annual Ignite Award at the Cristo Rey Dallas CEO Breakfast for championing a similar program at the South Dallas school. Cristo Rey Dallas board chair David Moran said the Stephens had provided opportunity and inspirations for school’s students. Michele Stephens has served as the heart of the school since it opened in 2015 as a committed supporter of both faculty and staff, and volunteering as a mentor to students, Moran said. John Stephens has given guidance and support for both with capital efforts and as an advocate in the community, Moran said. AT&T now employs 16 students the school’s corporate work-study partnership, which allows the students to earn more than 65 percent of the cost of their own education. Stephens stressed to the more than 180 attendees at the award breakfast the importance of being involved with the program.